Areas of upwelling in red. An Upwelling is an oceanographic phenomenon that involves wind-driven motion of dense, cooler, and usually nutrient-rich water towards the ocean surface, replacing the warmer, usually nutrient-depleted surface water. There are at least five types of upwelling: coastal upwelling, large-scale wind-driven upwelling in the ocean interior, upwelling associated with eddies, topographically-associated upwelling, and broad-diffusive upwelling in the ocean interior. Coastal upwelling is the best known type of upwelling, and the most closely related to human activities as it supports some of the most productive fisheries in the world, like small pelagics (sardines, anchovies, etc.). Deep waters are rich in nutrients which include nitrate and phosphate, themselves the result of decomposition of sinking organic matter (dead/detrital plankton) from surface waters. When brought to the surface, these nutrients are utilized by phytoplankton, along with dissolved CO2 (carbon dioxide) and light energy from the sun, to produce organic compounds, through the process of photosynthesis. Upwelling regions therefore result in very high levels of primary production (the amount of carbon fixed by phytoplankton) in comparison to other areas of the ocean. High primary production propagates up the food chain because phytoplankton are at the base of the oceanic food chain. 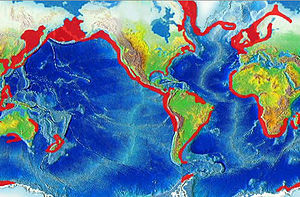 Regions of upwelling include coastal Peru , Chile, Arabian Sea , western South Africa, eastern New Zealand , southeastern Brazil and the California coast. Due to this being a food chain, this means that every species is a key species within the upwelling zone. The key piece of physics that gives rise to coastal upwelling is the Coriolis effect, by which wind-driven currents tend to be driven to the right of the winds in the Northern Hemisphere and to the left of the winds in the Southern Hemisphere. For example, in the northern Hemisphere, when winds blow either equatorward along an eastern ocean boundary or poleward along a western ocean boundary, surface waters are driven away from the coasts (Ekman transport or Ekman spiral) and replaced by denser waters from below. Large-scale upwelling is also found in the Southern Ocean. Here, strong westerly (eastward) winds blow around Antarctica,driving a significant flow of water northwards. This is actually a type of coastal upwelling. Since there are no continents in a band of open latitudes between South America and the tip of the Antarctic Peninsula, some of this water is drawn up from great depths. In many numerical models and observational syntheses, the Southern Ocean upwelling represents the primary means by which deep dense water is brought to the surface. Shallower, wind-driven upwelling is also found in off the west coasts of North and South America, northwest and southwest Africa, and southwest Australia, all associated with oceanic subtropical high pressure circulations (see coastal upwelling above). Localized upwelling may be due to deflection of deep currents by a seamount providing a nutrient rich island in otherwise low productivity ocean areas. These provide islands of life in such areas and are important to migrating species and human fishing. Upwelling can also occur when a tropical cyclone transits an area, usually when moving at speeds of less than 5 mph (8 km/h). The churning of a cyclone eventually draws up cooler water from lower layers of the ocean. This causes the cyclone to weaken. This type of upwelling is produced by devices that use ocean wave energy or ocean thermal energy conversion to pump water to the surface. Such devices have been shown to produce plankton blooms. Upwellings also occur in other fluid environments, such as lakes, the magma in Earth's mantle or the plasma within a star. They are often a result of convection. Animation demonstrates the upwelling process.